The SNZ-6320 2 MP Full HD 32x Zoom Network Camera from Samsung incorporates a 1/2.8" CMOS sensor that captures clear images in Full HD resolution of up to 1920 x 1080. 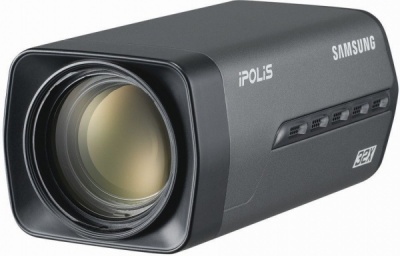 The 32x optical zoom lets you close in on objects without losing detail. The camera supports H.264, MJPEG dual codec, multiple streaming. The Intelligent Video Analytics supported are Tampering, Virtual line, Enter / Exit, (Dis) Appear, Audio detection, Face detection.